If you put our post code (GL54 2BU) into many Sat Nav databases, you will be sent to Victoria Street in Cheltenham, which is 17 miles away! If in doubt, just enter the village name – Bourton on the Water. If you are travelling from the London direction, you are advised not to use the M40/A40 via Oxford unless you can be sure that traffic is light. Oxford in the rush hour is a real bottleneck and should be avoided. When planning how to get from say Heathrow to Bourton you should seriously consider a taxi. Dennis Walmsley for example (see below) charges £170 for the journey at the time of writing. Even if there are only two people in the party, it can often be cheaper than the train - and considerably more convenient. Approaching from London, Gatwick and Heathrow. - Take the M4 out of London westbound for about 60 miles from the start of the M4. - Leave M4 at junction 15 (Swindon). Turn right at exit roundabout and take A419/A417 to Cirencester – 17 miles. - Leave the A417 at Cirencester/Stow. On exit, there are two roundabouts then some traffic lights very close together. Turn right at the first roundabout, straight over the second roundabout and left at the traffic lights along the A429 towards Stow (Note: Bourton is four miles before Stow). - Follow the A429 for 15 miles until you come to a set of traffic lights at Bourton. Turn right here for just over half a mile until you see the Post Office in front of you. Turn right at the Post Office and immediately left, over the river, then first right into Victoria Street. - The Cotswold Perfumery is 100 yards down Victoria Street on the left hand side. - Get these directions in map form. - Leave the M5 at junction 11A (Cirencester/Gloucester) and turn left at the exit roundabout (A417 Cirencester, Gloucester) for 3.5 miles. - Straight over the next roundabout (A36 Stow on the Wold). - After 2 miles you come to a double roundabout. Turn left at the 1st and immediately right at the 2nd (A436 Stow). - After 3 miles there are two left turns close together – take the second left, immediately after the Kilkeney Inn. Follow this road for about a mile into Andoversford. - At Andoversford turn left at the T junction with the A40 and immediately right at traffic lights (A436 Bourton/Stow). - After 9 miles you come to a T junction with the A429. Turn left here for about one mile until you come to a set of traffic lights at Bourton. Turn right here for just over half a mile until you see the Post Office in front of you. Turn right at the Post Office and immediately left, over the river, then first right into Victoria Street. Approaching from the North West (M5, Birmingham). - Leave the M5 Southbound at junction 9 (A46 Evesham). At the exit roundabout turn left along the A46 for 3 miles. - At the next roundabout take the third exit (B4077 Stow) to the next village – Toddington. Go straight over the roundabout in Toddington. - The next village is Ford. About 2 miles after Ford watch out for a right turn to Bourton on the Water. - After about 5 miles, go straight over the cross roads with the B4068 and on to the T junction with the A429. Turn left at this junction and then fairly soon right at the traffic lights, into Bourton. - After about half a mile you will see the Post Office in front of you. Turn right at the Post Office and immediately left, over the river, then first right into Victoria Street. Bourton can get very busy depending on the time of year and time of day. There is no parking at the Perfumery itself - unless you are staying in one of our apartments. There is no parking restriction in Victoria Street, immediately outside the Perfumery, so if you are lucky enough to get one of these, you can stay all day. It's worth having a look. At the end of Victoria Street there is a small square with 7 parking bays. These are restricted to 4 hours and that applies from 8am to 11pm, 7 days a week. If you are doing one of our Perfumery Courses, these bays are not suitable because you would have to re-park in the middle of the course. 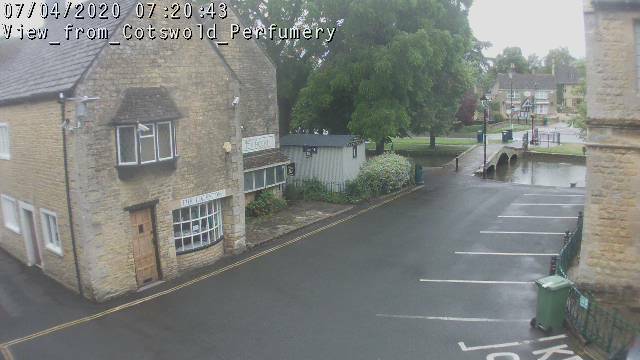 Otherwise, there are two large car parks in Bourton, both the same distance from the Perfumery - 300 yards. One is in Station Road and the other in Rissington Road. Both cost approximately £7 to park all day and the machines take credit/debit cards as well as cash. After parking, make your way to the village centre where you will see the main village green. In the middle of the green is a small footbridge that crosses the river. You can see this footbridge on our live webcam. If you are standing on that footbridge facing away from the main High Street shops, you will be facing the Perfumery. - The nearest railway station to Bourton is Moreton in Marsh (9 miles) or Cheltenham (16 miles). - Trains from London to both of these stations leave from Paddington. - Pulhams Coaches run services from Cheltenham (Service 801) and from Moreton (Service 803). - In Cheltenham you will need a taxi from the railway station to the bus station in the centre of town – Royal Well. - Please check the Pulhams Coaches website for timetables. They do not run on Sundays, so see taxis below. - In Bourton, Pulhams Coaches stop in the village centre – about 100 yards from the Perfumery.